DTAA Members are able to access a list of past research forum webinar topics on the members only resources page here. 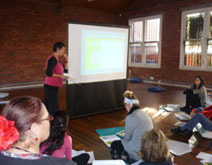 The Dance Movement Therapy Association of Australasia (DTAA) is excited to welcome Nana Koch to Melbourne. Nana was closely mentored by Liljan Espanek – a pioneer of dance movement therapy in the USA – when she was a student, and is now a leader in her field in carrying Espanek’s legacies forward. Join us for this very special event, which is the first time this pioneer’s theories and philosophies, that were strongly influenced by Wigman, Adler and Lowen, have been presented in Australia in this capacity. In this workshop attention is paid to the ways in which Liljan used expressive dance and diagnostic movement tools to facilitate integration, the ideal body, and feelings of well-being. Adler and Lowen’s influence on Espenak’s work is discussed, along with concepts inherent in psychomotor therapy and its areas of application. By acquainting participants with Espenak’s concepts of diagnosis, restructuring, and integration, they will learn how she used particular exercises to help patients express “the four emotions,” develop muscle-memory, and experience catharsis, all leading to behavioural change. This two day workshop will be suitable for dance movement therapists, psychotherapists, psychologists and creative arts therapists. For more information: download flyer or book here. The DTAA is pleased to welcome Amber Gray back to Australia for Part 3 of Body as Voice. Amber offers unique training in Restorative Movement Psychotherapy for survivors of trauma in a body, movement, and rhythm based framework. Part 3 of Body as Voice will build on and continue work with the dyadic therapeutic relationship – integrating working with families, groups and communities. This group- focused module emphasises integration, wholism and restoration of a sense of belonging. Polyvagal informed DMT is elaborated, and based on the group composition, working with everything from group therapy to large-scale disaster and complex humanitarian emergency responses are optional topics. This class serves as an integration and closure for the cohort. Body as Voice Part 1 and 2 are prerequisites for attending this workshop, please contact admin@dtaa.org.au if you think you may qualify for admission based on other experience. For more information please download flyer or book here. 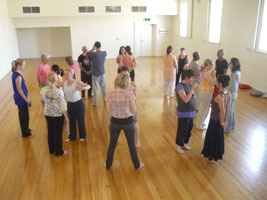 The Dance Movement Therapy Association of Australasia (DTAA) invites dance movement therapists, counsellors, psychotherapists, creative arts therapists, body workers, dancers, and those interested in exploring the use of movement and dance in their work to join us for this two-day immersion into the practice of Authentic Movement. This professional development workshop, facilitated by international presenter Connor Kelly, is suitable for practising and student therapists and practitioners. For more information download flyer or book here. Friday 26 October: PD workshop Writing for Publication, Sue Mullane, 10.30-4.30 pm. Venue: Fitzroy (as above). Saturday 27 October: Workshop with international guest presenter Jilba Wallace on ‘Using Neuroscience to explain what DM therapists do’ (as above). Informal dinner, Empress Hotel, corner Nicholson and Scotchmer Sts, North Fitzroy. Sunday 28 October: AGM meeting, discussions and presentations: 9.30 am to 4.30 pm. It’s a very important day for our profession where members have the opportunity to learn about and contribute to new developments. Please make your best effort to attend either in person or by Zoom from anywhere! This workshop is designed to help established dance therapists and/or students, to explain the vocabulary and advances in Neuroscience, and how they relate to current dance/movement therapy practice. This can help clients understand the mind/body connection better and become more open to the interventions the dance/movement therapist offers. Jilba will present some current neuroscience theories of trauma, movement and the body, and coach participants on how to use explanations as well as make appropriate interventions with clients in a private practice setting. Therapy models will include Christine Caldwell’s “The Moving Cycle”, Bessel Van der Kolk’s trauma work, Sensorimotor Psychotherapy and Dialectical Behaviour Therapy. Bargoonga Nganjin, North Fitzroy Library, 182 St Georges Road, North Fitzroy. This workshop offers participants the opportunity to know how to create and cultivate good writing practices useful for supporting professional life. 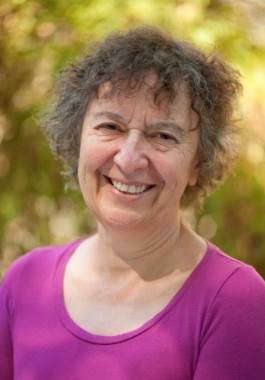 It references the work of Helen Sword, NZ-based scholar, teacher and poet, who has published widely on shaping personal habits which more reliably lead to successful academic writing. The workshop will study some of these suggestions, as well as weave in creative writing techniques involving DMT tools such as use of breath, tuning into the body and connection to sensory awareness to stimulate immersion in language. In somatics and dance movement therapy practices, embodiment is a core philosophical assumption, one that is so embedded in what we do that we may find it challenging to articulate or identify what we mean by the term. This symposium will offer a wide range of opportunities to investigate and reflect on meanings and experiences of embodiment, in order to share, deepen and enrich our somatic practices. We invite you to be part of this inaugural Australian somatics symposium, joining leaders from the fields of somatics, dance and dance movement therapy, all of whom share a common interest in embodied practices. The historic Abbotsford Convent provides the perfect venue for this rich program of deeply experiential movement workshops, thoughtful presentations and discussion, reflection and professional development. For more information please visit the symposium webpage or download flyer. Join us for one or two days as we experience dance as a natural resource that supports release, expression and unfolding. These two workshops offer you an opportunity to explore authentic expression of the body’s wisdom. Discover how movement and dance move beyond the mind to support healing and the fulfilment of potential. The workshops are suitable for practising and student dance movement therapists, psychotherapists, creative arts therapists, wellness practitioners and those interested in exploring how dance can be used in therapy. Drawing on the latest research in neuroscience and anthropology, you will explore experientially how movement and dance goes beyond words, to deepen and enhance therapy. 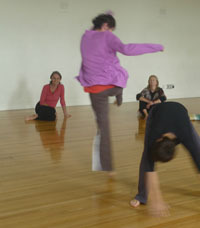 Deepen your experience of embodiment, exploring authentic movement and dance. Build your confidence and connect to “who you really are”. 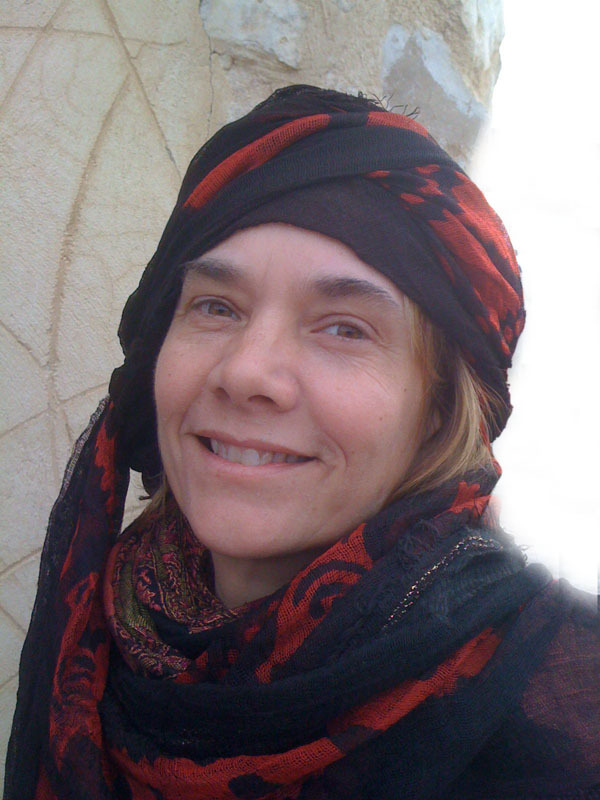 Virginia Woods is a psychologist, dance-movement and creative arts therapist, and somatic psychotherapist (Hakomi trained). Virginia is an experienced therapist who confidently supports people to work through old patterns into being in their true experience of self. Please note you must have competed PART 1 to be eligible to participate in PART 2 of this valuable training. Amber’s 3-part training is based on her 20 years experience as a Dance Movement Therapist and Somatic Psychotherapist specializing in interpersonal trauma, including torture treatment, refugee mental health, ritual abuse, childhood trauma and human rights violations, in cross cultural contexts. Of note, Part 1 and 2 are currently approved for ADTA Alternate Route (Graduate Level) Training, and Part 3 is in process. Part 2, “Body as Voice: Body Wisdom”, will emphasize embodiment of resources with somatic and movement-based processing of trauma narratives, to support connection and meaning making and Part 3 “Body as Voice: The Collective Body”, builds on work with the dyadic therapeutic relationship, integrating working with families, groups and communities. It emphasizes integration, wholism and restoration of a sense of belonging. DTAA’s first webinar featuring DM therapist Noa Belling on Mind-body Awareness: practical strategies is now available here. Webinar: Mind-Body Awareness & Practical Strategies, with Noa Belling, Tuesday 6th March. In this webinar Noa, author, somatic psychologist and dance movement therapist, shared her inspiration and some of the practical strategies offered in her new book, The Mindful Body: Build emotional strength and manage stress with body mindfulness. A recording of the session is now available here. Excerpt from Noa’s book: Exploring your mind-body connection; TV interview about Noa’s work here. This event qualified for 1 hour of DTAA CPD Category B. In Australia, The Mindful Body is available through most bookstores, online through booktopia or directly from Rockpool Publishing in Sydney. When you listen to your body, what does it say? When you witness the movement of your therapy clients or fellow artists, what stories do they seem to tell? This two-day experiential workshop provides a deep experiential dive into your body of experience, develops your skills in facilitating others to share their stories in movement. The sessions are designed for both experienced dance movement therapists and those who may be new to the field, or working in associated professions of somatic practices, performing arts or movement education. 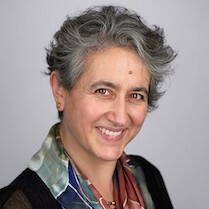 Founding Director of Boas Consulting, a pioneering enterprise that facilitates individual and collective transformation for transnational corporations, governments, NGOs and academic institutions in over 100 different countries, and formerly senior lecturer in the anthropology and sociology of dance at the Laban Centre of London, Sara is also a registered dance movement psychotherapist and practising artist. Sensing, moving, writing, witnessing and voicing, this workshop invites you to explore the depths of your own life experience and history and to practice holding space for storytelling of the body to unfold. This event qualified for DTAA CPD 12 hours Category A.
Marylee Hardenbergh is a DMT and choreographer who loves to organise out door specific choreographies, she has done this for over thirty years. She is the Artistic Director of Global Site Performance and a founding member/original Artistic Director of Global Water Dances. She has received numerous awards and grants including fellowships for choreography from the National Endowment of the Arts in the USA and the Soros Foundation. She was honored to be Marian Chace lecturer at the American Dance Therapy Association conference in 2015. 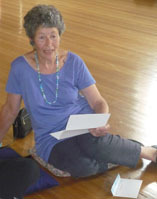 She’s been a practicing dance therapist for 40 years and has led many movement choirs. She trained under Irmgard Bartenieff and Penny Lewis Bernstein; she is also a Certified Movement Analyst and a Board-Certified DMT. She loves to use space harmony in her work, and brings in a therapeutic sensitivity to all of her choreography. 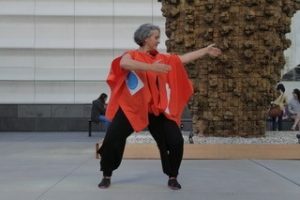 In Hardenbergh’s workshop planned for Melbourne, she will discuss the therapeutic aspects of creating community-based Movement Choirs and performances. Working together with Melbourne dance and dance therapy communities, her weekend workshop will culminate in creating a site-specific event performed at a place chosen with the participants. 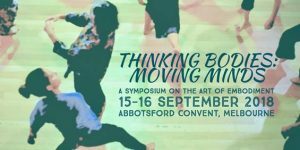 Amber Gray is returning to Australia to offer her unique body, movement and rhythm-based framework for promoting resiliency and processing traumatic experience in clients who are survivors of traumatic life events. Restorative Movement Psychotherapy (RMP) is a components based framework that promotes embodied presence through structured somatic skills, and verbal and non-verbal processing, to support survivors’ restorative process. It has been cited in numerous peer reviewed and academic chapters, and has been taught in Australia, Haiti, Indonesia, Norway, Lebanon and the United States. Join your fellow DTAA members for a weekend of professional development and connection. Hear about the latest developments of our subcommittees, including progress towards registration with NDIS. Contribute to discussions re-development of new competencies for DMT and welcome new Professional and Provisional Members. Friday 20: Workshop: Kim Dunphy and Sue Mullane, Writing for Publication Venue: Bargoonga Nganjin, North Fitzroy Library, 182 St Georges Road, North Fitzroy). Venue: Community Room, Edinburgh Gardens, Brunswick St, Fitzroy North. This workshop is only available for those who attend in person. Program: Early morning movement warm-up with Robyn Price (9.30-10.30); NDIS project panel and discussion (NDIS Sub-Committee)(10.45 – 11.45) and Professional Membership clinic with Sandra Lauffenburger (10.45 – 11.45), AGM and presentation of Annual Report (12.30-1.30), competency project discussions, definition and journal discussions (1.30-2.50 pm), book launch, HEMF Award and awarding of Provisional and Professional Memberships(3-4 pm), followed by drinks and nibbles (4-4.30 pm). While dance movement and other creative arts therapists are highly skilled in considering clients’ needs and developing therapeutic programs to address those, they often struggle with finding ways to fund that work. This workshop helps address that problem by offering a practical and hands-on session in seeking out and writing successful grant applications. This session offers participants the opportunity to develop a successful grant proposal. It includes skill development in finding a relevant grant opportunity, sharpening responses to selection criteria, providing relevant background and articulating the benefits of the proposed project for stakeholders from funders, to participants and the wider profession. Participants should come with a specific project or grant round in mind, and will spend the day working specifically on that task. Expect to complete the session with a proposal well-developed for submission! Participants who are not able to attend in person are invited to participate in the workshop using free conferencing technology Zoom. The session is especially developed to support applicants to the Hanny Exiner Me morial Foundation grants for DMT research which close on July 17. Another session later in the year will offer professional development in how to write for publication. 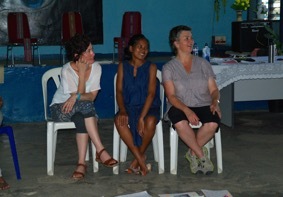 Photo: HEMF recipient Marita Jacobsson, with Nelinha Pereira and Kim Dunphy in 2014, in Timor-Leste undertaking her research project. Presenter: Kim Dunphy has written successful grant proposals for hundreds of thousands of dollars to funding bodies in Australia and other countries, including local, state and federal governments, philanthropic organisations, private funders, universities, professional service organisations (including PACFA and UNESCO), and others. All of these have been for arts projects or research and many for dance movement therapy. She has also made successful proposals to HEMF and supported several other DM therapists to write them also. Kim’s most recent application was for a Mackenzie Post-Doctoral Fellowship at the University of Melbourne, where she is now Australasia’s first salaried DMT researcher. The Dance-Movement Australasia (DTAA) is delighted to present two professional development-in-movement workshops facilitated by International dancer, healer, researcher and leadership coach Sara Boas. From Friday, May 5 to Sunday, May 7, 2017, Sara and the DTAA welcome DMTs, psychotherapists, arts therapists, wellness practitioners, coaches, consultants, dancers and other artists to join us at the historic Drill Hall dance space on the water’s edge at Sydney’s Darling Point for one, two or three days of movement-based exploration and learning. Through an intensive experiential engagement, the workshop explores the real challenges and opportunities that we encounter in our work, whether or not our practice is explicitly ‘cross-cultural’. Participants are encouraged to question their own assumptions about culture, identity, ‘difference’ and more, and to develop new ideas and ways of working, all within a safe and supportive learning environment. Saturday and Sunday: Art Making as Healing. This two-day workshop focuses on the therapeutic value of creation and performance, as well as the artistic potential of therapeutic process. With a focus on dance and improvisational movement, but also incorporating poetry and drawing, the workshop combines experiential exploration with reflection, discussion, and theoretical analysis. Laban Movement Analysis: Teasing out the essentials for Dance Movement Therapy and other movement practices. Jane Guthrie and Heather Hill combine to present a workshop that connects LMA theory with practical application in the field. In order to do so, they will draw on specific areas for the purposes of recording movement observations and analysis, program planning and development. A “walk through” the main areas of the LMA framework, drawing on theory, embodied experience/practice and observational exercises which include practicing using the language of LMA. Presentation of how the framework has been applied to a population with dementia for observation, planning and evaluation. Drawing attention to the psychological and social aspects of LMA, and implications for planning therapeutic interventions with this group of people. Consideration of LMA application to other populations, through case studies from a wide range of areas, and small group discussion and presentation. Throughout the workshop, there will be opportunities to engage with and embody the LMA theory, to practice observations, and to workshop applications to particular contexts. Participants are invited to bring in case material from their practice, or consider their own movement profiles and what might be important movement experiences. Jane is a CMA as well as a DMT and physiotherapist. Her knowledge and experience from this background is linked with Heather’s approach as a specialist in the area of Dementia and person centred care. Their approaches to using LMA complement each other but come from differing perspectives. Heather is a DMT who has worked for 30 years with older adults and people with dementia. Take this opportunity to build up supervision hours and be involved in sharing with your peers. A professional membership clinic will be conducted across the lunchtime break from 1.0 – 2.00 pm. There is no charge for this. It provides a great opportunity for increasing needed supervision hours. Participants should have an issue or issues in mind that they are prepared to discuss and reflect upon. Please register for this event by emailing admin@dtaa.org.au. We will provide EFT details on registration. The running of this event is dependent on attendee numbers so to ensure it goes ahead please ensure you register ASAP. 2.45 pm- 4 pm: The AGM will include a presentation of the usual report of activities and financials for the 14-15 financial year. Draft documents will be presented for discussion about several important topics followed by presentations of new Professional Memberships and the HEMF Award for 2016. Assessing clients’ progress in DMT: considering successful practice and challenges, led by Professional DTAA members, Dr Kim Dunphy and Sue Mullane This event will offer supervision focussing on assessment of client progress in DMT. Participants will discuss their current practices of assessment, considering aspects that are successful and useful and those that are challenging. A technological tool for assessment, Marking the Moves iPad app, will be introduced briefly and participants invited to consider its usefulness for their context. Venue: Edinburgh Gardens Community Rooms, Edinburgh Gardens, Alfred Crescent (off Brunswick Street) North Fitzroy. encouraged to look at them in different ways to reveal different perspectives. This workshop provided theoretical, scientific, and contemplative rationale for the use of movement as measure of protection, self-care, and increased resilience, as well as an emergent best practice approach for therapeutic work with survivors of trauma. 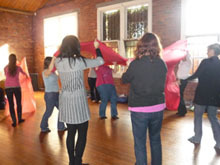 It covered breath, movement, rhythm and dance based practices that promote resilience and that can be used in therapeutic work with survivor clients of all ages. Amber Gray is a licensed mental health professional, an award winning dance movement therapist, who is trained in Somatic Psychology, Contemplative Psychology, Somatic Experiencing, EMDR, parent child psychotherapy (an attachment model), trauma focused CBT, Historic Trauma, cranial sacral therapy, deep tissue bodywork, energy medicine, shiatsu, ecopsychology, and authentic movement. 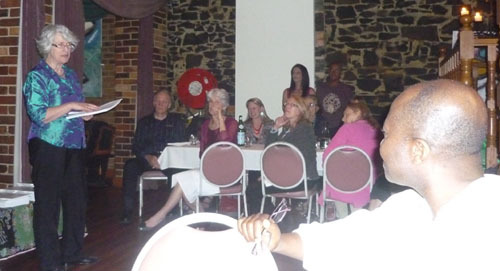 The Dance Movement Therapy Association of Australia turned 21 in 2015. The conference explored how dance movement therapy and other creative arts therapies function as single and multi-modal approaches to health and healing; and how dance movement therapists make valued contributions to multi-disciplinary teams. We were honoured to have Dr. Sherry Goodill, Chairperson of the Department of Creative Arts Therapies at Drexel University, USA, and President of the American Dance Therapy Association, confirmed as our first keynote speaker. Pre and post conference workshops with local and international presenters were offered. Our strength is our fluidity. As water undulates, spirals, and flows, so do we. This playshop combines the healing soundstreams and movements of Continuum with the dynamic play of Emilie Conrad’s Jungle Gym Fitness. We will invigorate our fluid systems and creatively explore our relationship to gravity through waves, spirals and involutions. Dancing with gravity, we increase our adaptability, flexibility and resilience. Fluid, dynamic strength allows for greater ease and range of movement without the inherent detrimental effects of traditional strength models. 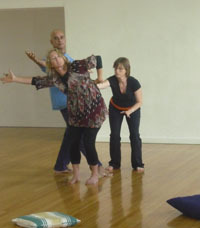 Our movement explorations will dance the continuum from slow flow and ease to energizing, dynamic and strengthening. This playshop is appropriate for all therapeutic, movement and bodywork practitioners, and for all bodies and fitness levels. award winning dance movement therapist. Amber has worked for many years with people who have survived violation, human rights abuses, and terror. Amber uses Continuum movement as a primary restorative practice in her work, and for resilience after injury, illness and chronic stress. Her teaching often combines Continuum with dance movement therapy, somatic psychology, current trauma and neuropsychological research, movement therapy, life impressions bodywork, ritual, and creative arts. Exposure to traumatic events literally and metaphorically “freezes” our bodies, minds and spirits in a “lock-down” of past memories. Current neuro-psychiatric research has shown that when someone is traumatized, a majority of traumatic memory is implicit— or sensory-motoric and image-based. Many of the researchers endorse the use of non-verbal therapies for survivors to fully integrate the past with the present and restore well-being and balance. This training will support clinicians, dance movement therapists, art therapists, and somatic therapists to work with survivors of trauma (in particular, relational trauma, complex trauma, and trauma secondary to violence) using a variety of very practical, body, movement, and dance-based approaches. It will benefit all mental health professionals who work with survivors of trauma and wish to integrate body-based and creative arts approaches into their work in individual and group contexts. The pathways include neurobiological research such as Stephen Porge’s Polyvagal Theory, Dance/Movement Therapy, Somatic Psychology, Continuum Movement, and Embodied Developmental Psychology. This workshop will integrate a framework for working with rhythmicity co-collaborated by the facilitator with Dr Porges. Run by Amber Gray – award winning dance movement therapist. Amber is a licensed mental health professional specialized in working with survivors of trauma. She is an award winning dance movement therapist, who is trained in Somatic Psychology, Somatic Experiencing, EMDR, Trauma Focused Cognitive Behavioral Therapy, Historic Trauma, and Authentic Movement. She is also an Authorized Continuum Movement teacher and an advocate of human rights. The morning workshop provides a model for a dance/expressive movement program that is fun, engaging and esteem-building; while in the afternoon ‘The Dance of Interaction: Embodied Relationships in Dementia Care’, will focus on Quality of life (QoL) indicators that are relevant to this population. How does dance fit into person-centred care in dementia programming? Heather will introduce person-centred care, lead a dance experience and show you different ways to develop simple material, while also identifying the important aspects of a dance and movement session. Embody the experience of the person with dementia, identify key aspects and themes of the work, ideas for music and props, look at the challenges that present in various settings and with different groups, e.g. people in the latter stages of dementia, and understand what happens when dance meets person-centred care. Heather Hill, PhD, M.Ed, B.A., Grad.Dip. Movement and Dance, Grad.Cert. 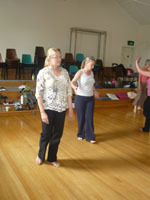 Dance Therapy, Professional Member of the Dance Movement Therapy Association of Australia is a consultant in dementia and aged care and a dance movement therapist. She has worked for almost 30 years in the field of dementia, and lectured in dance therapy, creative arts therapy and arts-based inquiry. Heather has written journal articles, book chapters and two books for caregivers on dance for people with dementia: “Invitation to the Dance” (Stirling University, 2001, 2009) and “Let me stay and dance with you” published in Japanese (Creates Kamogawa, 2014). 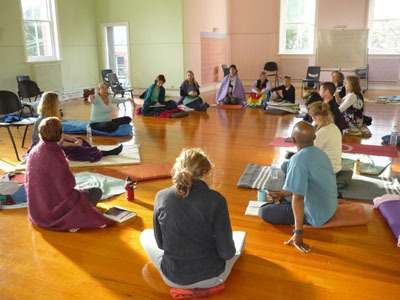 Experiential supervision for DTAA members. Keynote speaker: Professor Emeritus of Counselling and John Macleod, University of Abertay, Scotland. The conference will explore how counsellors and psychotherapists support clients with the complex challenges of life and relationships in the 21st century. Becoming Human: How do we embody cultural, familial and engendered experiences in our ever-changing bodies as practitioners? Amber Gray; Body as Voice Part three Somatic and Creative Arts Approaches to Working with Survivors of Trauma. Continuum, Trauma and the Restorative Process with Amber Gray. The Convent, Dorm 1, Rosina Building – 1 St Helier Street Abbotsford, Melbourne. 1 St Helier Street Abbotsford, Melbourne. This training series will prepare clinicians, dance movement therapists, art therapists, and somatic therapists to work with survivors of trauma and strongly emphasizes mitigation of secondary trauma through practitioner self-care. featuring Josselin Butté’s live music and percussion. 1, St Heliers Street, Abbotsford, Melbourne. Four day workshop 9.30 – 5 pm daily. Introduces participants to the application of somatic psychology and creative arts therapies with survivors of severe trauma, such as mass trauma (natural and human-made disasters) and extreme interpersonal violence. A sampling of the literature on somatic and creative approaches to working with this population is included with emphasis on cross culturally congruent resource and strength oriented approaches to both practitioners own somatic awareness, and clinical practice. The emphasis of Part 1 is on establishing relative safety and stability; cultivating, somatic awareness, and the primary portals to the body for embodied self awareness and care. This is a dynamic, hands-on, practically applied format with a need to dress comfortably and be ready to move. Saturday 6 July 2013, 9am-5pm. The Community Rooms, Abbotsford Convent Melbourne. One day Symposium with presentations from associations ANZATA, DTAA, ACATA and AMTA, group work and participation. Saturday 6 July 2013, 9am-5pm. The Community Rooms, Abbotsford Convent, 1 Saint Heliers st, Abbotsford. Bookings essential. Further enquiries contact Jane Guthrie jguthrie@alphalink.com.au. How might the Fool, the Mover, and the Supervisor help the therapist to ‘see’ more clearly in the murky inter-subjective space? Dorm 1, Rosina Building, First Floor, Abbotsford Convent. The Chakras provide practical tools for the creation of strong physical and emotional connections. Combined with the spiritual blue print of the Chakras they provide a vehicle for healing. Egyptian dance expresses through spirals, waves, circles and strong connections to the earth – the patterns of the Chakras. Physical, emotional and spiritual change has been witnessed as a result of combining Egyptian dance to the physical expression and grounding they offer. Change has also been witnessed when they have been used within a DMT framework when working with various populations over the years. The workshop is aimed to provide the Dance Movement Therapist with some practical tools they can include in their DMT framework. Maria Sangiorgi is a Dance Movement Therapist and creator of Embodied Bellydance®. During her 23 year of teaching Bellydance and research into somatic movement practices she developed Embodied Bellydance®. She uses aspects of this in her therapeutic practice. As a Dance Movement Therapist, Maria works with the physically and intellectually handicapped and homeless woman with mental health issues. She also facilitates Dance Journeys for the Awakening Heart, including SensingFeelingDancing the Chakras, and Women Dance Retreats. She mixes media artist practices and Esoteric Healing. Maria is also a massage therapist and is currently living in Italy. Continuum is moving medicine. Emilie Conrad, creator of Continuum Movement, teaches that all fluids are basically one element, resonating with all other fluids. They function as a kind of umbilical cord supplying us with the pulsing undulations of life. Amber Gray, an authorized Continuum Movement Teacher and award winning dance movement therapist, who has worked for many years with people whom have survived violation, human rights abuses, and terror. Amber is using Continuum movement as a primary restorative practice in her work, and for resilience after injury, illness and chronic stress. Her teaching often combines Continuum with dance movement therapy, somatic psychology, current trauma and neuropsychological research, movement therapy, life impressions bodywork, ritual, and creative arts. This workshop is open to movement artists and practitioners, therapists, bodyworkers and all those committed to a deep exploration of how life reveals itself in each and every breath and movement we create. This workshop is an invitation to dive into the pool of existence within our cells and enter the play of life through Continuum, a practice that involves simple sound streams (to stir the fluid that resides within our tissues), breathing patterns, and slow, organic movements. In this workshop, we will have opportunities to address specific participant or client issues as defined by the group. The workshop will be organised so that attendees can participate in the weekend, even if they simply cannot attend on Friday evening, however,the experience offered will be much richer for those who can start at the beginning. This strategic initiative from the Association was aimed at encouraging eligible members to become Professional Members, to increase the professional Membership number, to benefit the profession and provide successful candidates with increased professional standing. The morning session provided reflective practice supervision opportunities for all members and continuing education hours for those who need them. Presenters: Kim Dunphy and Alex Jordan, from the DTAA in partnership with Darwin Community Arts and Ausdance N.T. The celebration was the final event in a two day summit seeking to explore potential collaborations across creative arts therapy disciplines across the Asia-Pacific. The DTAA invited a selected group of participants to attend as representatives of dance-movement therapy. Vivien is Professor and Director of National, International and Collaborative Programs at Lesley University in the USA, a dance therapist and expressive arts educator, and Phillip is Director of Arts Therapy at Whittier Street Health Center, Roxbury MA, an expressive arts educator/therapist, drama and music therapist who has developed and implemented integrated arts therapy programs for two decades. Participants in the workshop explored body based approaches to working with trauma; arts based interventions and experiential activities for working with specific populations. Presenter: Penelope Best’s extensive practice as a senior dance movement psychotherapist, clinical supervisor, international trainer and researcher supports her continued curiosity about the importance of the body within relationship. As President of the European Network for Dance Therapy (2007-2010) she is keenly aware of different views about core elements of therapeutic practice and training. With Dr Beatrice Allegranti, she has recently co-created the first UK accredited DMP supervision training. She is fascinated by the influence of cultural differences and has initiated and runs professional DMP trainings in Warsaw, Poland, Croatia and the Netherlands. She is an Honorary Fellow of ADMP UK, External Examiner for Derby University DMP Masters, Fellow of Higher Education Academy, consultant to the profession, and maintains both private therapy and supervisory practices while publishing regularly. She enjoys facilitating opportunities for learning, using mixed creative materials and critical reflexivity. . Her main area for research is the relational spaces within clinical supervision. 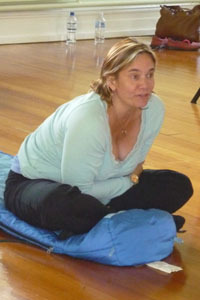 Penelope is well known to us in Australia (as Penny) from several visits between 2000 and 2006 to provide professional development and supervision for Australian dance-movement therapists. Sensorimotor Processing is a therapeutic modality created by Pat Ogden, PhD, who founded the Sensorimotor Psychotherapy Institute in Boulder, Colorado. There are many overlaps with dance movement therapy techniques such as those in the Moving Cycle (Christine Caldwell PhD) which help clients become aware of body sensations, movement inclinations and how these manifest into insightful, healing metaphors that can inform choices to change. This model works with resolving trauma patterns through tracking “procedural memory”, using mindfulness of body sensations, implicit memory and physical action. There is now a large body of neuroscience research to confirm the relevance of this technique and movement therapy for regulating emotions. Jilba will present some neuroscience theory and her experiences in working with sensorimotor and dance movement therapy in her private practice with individuals. Presenter: Jilba Wallace, from Colorado, USA, graduated from Naropa University (Colorado) in 1992 and continues to teach and to mentor there. She grew up in Australia and worked in the outback for seven years using drama and dance with aboriginal children. She has a private practice in a semi-rural area, and works part time in a psychiatric hospital running an intensive outpatient program, with a multi-disciplinary team in the USA. Her interests include liturgical dance, yoga, mindfulness practice and shamanic principles. Afternoon: ‘Finding the dance in dance movement therapy’ led by Anna Ganz. Continuum movement as based on the work pioneered by Emilie Conrad, increases flexibility, motility, well-being, creativity, innovation, adaptability and vitality on many levels. Because it does not rely on fixed patterns or postures, it enables us to access our capacity for fluid, free, non-constrained movement, which enhances a sense of youthfulness, aliveness and well being. It is a particularly valuable resource to use in the restorative movement process after trauma and for resilience after injury, illness and chronic stress. Amber Gray is using Continuum Movement more and more in her own work, and usually combines it into her innovative approaches to stress and trauma recovery. She combines it with somatic psychology, current trauma and neuropsychological research, movement therapy, ritual, and creative arts, in the trainings she provides for health and mental health professionals and paraprofessionals worldwide. In this workshop she will focus on Continuum Movement Practice as a means of teaching us to reduce physical limitations through movement innovation, to counter the “densifying” process of aging and stress, and increase both perceptual and mental awareness. Continuum was explored in this workshop as a powerful form of movement that can access individual and collective bio-intelligence, or body wisdom. It borrows from the authentic movement principle of witness to develop the abilities to use this conscious movement practice to discover, uncover and express deep inner experience as root to thoughts, feelings, actions and stories. 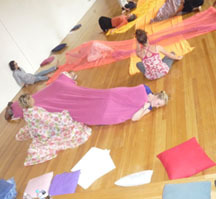 This course on continuum was a rich landscape of sound, breath and movement exploration to increase the awareness of the wellsprings of creativity, flexibility and joy that exists in the body and provide an opportunity to ground us into the experience of corporal presence. Continuum Movement experiences can provide the opportunity for growth and wellness for both the practitioner and their clients. Presenter: Amber Gray is a longtime practitioner of body centered arts and sciences (somatic psychology, massage therapy, Life Impressions Body-work, Dance movement therapy, energy medicine, cranio-sacral therapy, yoga, and shiatsu), and an advocate of human rights. 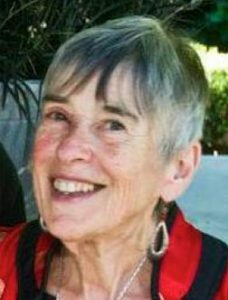 She is an authorized Continuum teacher, and a licensed mental health professional, who has worked internationally and nationally as an activist, an artist, a mental health professional, a program director and a trainer/consultant on behalf of victims of human rights abuses such as torture, war, and organized violence, for over twenty years. 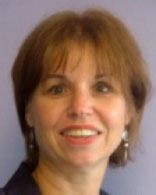 She is currently Director of Restorative Resources Consulting and Training. Her work has taken her to Indonesia, Kosova, Rwanda, Central America, Mexico, New Zealand, Croatia, Norway, Sweden, India, Sudan/Darfur, Lebanon, West Bank, Chad and of course her favorite country—Australia! Morning: focus on the practice and principles of dance and movement with people who have intellectual disabilities. reporting to parents, especially those from different cultural backgrounds. The essence of the workshop was the provision of self-reflective practice in the relationship between the therapist and clients. There was an emphasis on transference and counter transference and /or ‘mutual influences’. The importance of critical self-reflection and creative development of the therapist was emphasised, and looking at the therapist forming a part of a team approach. Movement preferences, ways of interacting with others, and identifying personal values and belief systems were explored, and the importance of respecting differences. The workshop provided attendees with five hours of professional development and / or supervision. This model of supervision is about refining attunement and listening to the space between. It is not about self or other but about ’Ways of seeing’ from a beyond the personal perspective, that provides the ability to move into any group. It is about the etheric field. Focuses more on self and other and encourages positional shifts, to allow for problems or issues to be seen from different perspectives. It involves relational shaping. The hours on this day can be counted as supervision, or alternatively professional development if supervision hours are not needed. with Kim Dunphy, dance-movement therapist, performing arts educator and community artist. This workshop provided an opportunity to DEFINE personal issues in professional settings; to DECONSTRUCT the physical, emotional; and kinesthetic elements of these issues; and to heal and restore our professional relationships through DANCE. Michelle Royal has degrees in the fields of Education,Movement Studies and the Arts, and a Diploma in Dance Movement Therapy (IDTIA). She draws on her training and skills in these modalities to develop and deliver specific programs for targeted groups in a variety of settings (community, educational, artistic and clinical). This afternoon workshop explored one model for facilitating group dance therapy processes based on some theoretical considerations. Sue, DMT, M.Ed. Melbourne Uni., Grad Dip Movt. 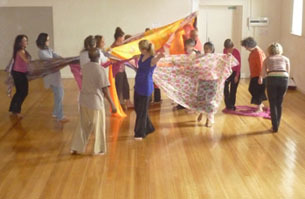 and Dance, has worked in movement and dance in a wide variety of educational and health settings for more than 20 years. She worked collaboratively with staff from the South Eastern Centre Against Sexual Assault (SECASA), Victoria, co-devising and co-facilitating group programs incorporating creative arts and dance therapy for women survivors of sexual assault. She now works full-time as a DMT at Sunshine Special Developmental School. An important aspect of professional practice, particularly in the area of therapy, is the expectation that practitioners will ongoingly reflect on, scrutinise and inquire into their practice, and this is usually formalised within a context of professional supervision. There are many different ways to carry out this reflective/inquiry process and this workshop offers one approach. Starting from a “moment” of experience, participants were invited to inquire into this experience through a variety of modalities – movement, art, words, etc.- and through engaging with other participants (via partner and small group work) to further their inquiry. *Time taken for this process of inquiry will count as supervision hours. The latter part of the day brought us back to what is at the heart of our practice, namely our connection with body. 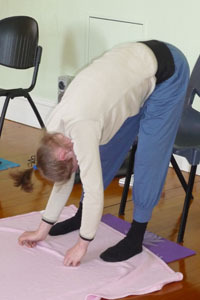 Jane Guthrie led a movement exploration that focussed on body connections from a developmental perspective as a foundation for all movement – to facilitate ease and efficiency – whether it be for expressive or functional purposes: focus on awareness of inner connections, how movement rides on the flow of breath, core distal connectivity and body integration. “Dance/movement therapists access their own world of the body, movement and creativity and can work with focused intent to make changes. The challenge in the professional setting is how to help clients/patients access their own resources (primarily the moving body) and integrate this, as well as explaining to peers in clinical settings how DMT can benefit the populations with which they work”. Jilba Wallace MA, LPC, ADTR, lives in Colorado USA where she moved after growing up in Australia. Funded for her choreography in the community, she worked in the outback for seven years using drama and dance with aboriginal children. She graduated from Naropa University (Colorado) in 1992 and continues to teach and mentor there. She is Secretary of the ADTA’s Rocky Mountain Chapter, has a private practice, and works part time in a psychiatric hospital running an intensive outpatient program with a multidisciplinary team. Her own interests include liturgical dance, yoga, mindfulness practice and studying shamanic principles. In this two day workshop Peggy explored the wide ranging threads of the LMA/Bartenieff work that can be used in DMT. Some aspects addressed include psychological issues and some more physical ones – which of course interweave with the psychological. Tracking changes of Body Connectivity, Energy (Effort), Shape, and Spatial usage of client¡¦s and students. Looking at the Effort “coloring,” that can combine with Body, Shape and Space in various ways that change the meaning. Being open to the non-knowing of what is coming next to allow true therapist ‘presence’. Creating a safe place for the client to listen to their own bodies and develop their own inner witness and value their own messages. Becoming more aware of “Shadow Movements”, which with the client¡¦s words (which may contradict the movement being done), and messages from the practitioner¡¦s body, together form “Embodied Attentiveness” (so called by Katya Bloom). Becoming aware of the differences in relationships with the same or contrasting Effort qualities in interacting Kinespheres and the use of this in developing empathy and/or clashing in the therapeutic relationship and why both are needed. Tracking the underlying patterns of Developmental Movement that support the person and building up a set of movement patterns that help to organize the body from a lower brain level. In this workshop, Amber combined theory with embodied exploration to introduce the CPF, an innovative model that is rooted in DMT and integrates somatic and creative arts modalities into the restorative process. The Model can be used in a in a wide range of therapy applications and, as well as for DMTs, it is very relevant for creative arts therapists and psychotherapists using movement. The framework specifically addresses and honors the complexities of working with movement, dance and the body across diverse cultures, and the long term impact trauma has on survivors’ life experience. Approaches and methods to facilitate restoration, and the importance of culture as both a resource and a paradigm to guide somatic and expressive arts interventions were highlighted. 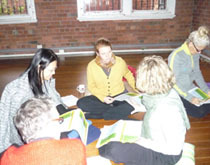 Participants were encouraged to integrate the strength-based CPF into their dance-movement therapy practice, at the same time as cultivating somatic self-awareness, and stability in their own bodies. Amber Gray, MPH, MA, ADTR, NCC, LPCC, provides training and consultation nationally and internationally on the application of dance-movement therapy and somatic psychotherapy to work with interpersonal trauma and conflict situations. She has a wealth of experience in treatment of trauma and torture survivors and childrens traumatic stress problems, using kinesthetic and non-verbal approaches. 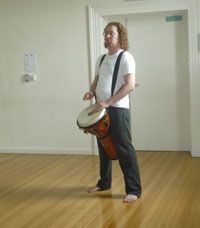 Amber also specializes in areas such as rhythm based rituals in clinical practice. She is the present Director of Restorative Resources Consulting and Training, Refugee Mental Health Coordinator for the State of New Mexico, and The Raven Drum Foundation’s Trauma and Resiliency Program Director. How can dance and dance-movement therapy contribute to well-being and personal growth? How can dance and dance-movement therapy be employed as tools for health and healing? How can dance and dance-movement therapy contribute to the development of communities?